Vern Cotter and Joe Schmidt know each other well and have worked together in the past. If they had a 'good cop/bad cop' routine, I'd imagine that Vern was the 'bad cop'. One month ago, Vern Cotter took les Jaunards to the South West of France for a dress rehearsal of their Heineken Cup semi-final against Leinster. Clermont travelled not to Bordeaux, but to Biarritz: it’s the same length journey in the same direction and they travelled by air, rather than the traditional four hour coach trip. Cotter, like fellow Kiwi Joe Schmidt, is a believer in reducing the margin for error. He considered that the trip to Biarritz would be a good dry run in the eventuality that his team beat Saracens a week later, and qualified for the European Cup semi-final. Though Biarritz were struggling in terms of their position in the league, the return of Harinordoquy and Yachvilli and a recent run of good results had stiffened their resolve.The 15-14 defeat that Clermont shipped in Parc Aguillera was largely overlooked by media, but The Mole noticed it and wondered why and how it happened. One of our faithful beret-wearing cousins provided the answers to both questions. The ‘how’ he told us at Mole Towers, was largely a question of four players, three Biarrots – Dimitri Yachvili, Imanol Harinordoquy and Yvan Watremez – and one of les Jaunards, Morgan Parra. Not every team has a Yachvili and a Harinordoquy, but worse players can put pressure on opposition halfbacks. Yachvili and Harinordoquy dedicated their afternoon to the attention of their French team-mate Parra. When he went to put the ball into the scrum, Yachvili ‘clumsily’ stood on his toe or jogged his arm. When he stood in the scrum-half position at line-outs, Harinodoquy followed every tap through with a personal introduction. When Parra dive-passed to Brock James from the base of the scrum, he inevitably felt Yachvili land on his calves and legs, the despairing dive just too late to catch him in possession. When he put up box-kicks – and he did a lot on a windy afternoon – Yashvilli came around the front and Harinordoquy from the back of the line-out to once again greet Parra with a healthy thump of respect. Whilst this old school, private duel was proceeding, the 23 year-old loose-head prop Yvan Watremez was giving his older and more illustrious direct opponent, Vincent Debaty, the Belgian-born current French international, a very practical lesson in physics. Munster and Ireland fans will be familiar with the practical: a good little loosehead gets under a big tighthead and pops him up like a cork out of a champagne bottle. Biarritz and France have unearthed another superb scrummager … and discovered than Debaty may be big tough dude, but he is not the real deal as a tighthead. Biarritz celebrated their victory with an euphoria doubled by the coincidence that their ancient Basque rivals Bayonne had conceded almost 50 points to Perpignan on the same day. For the past two months, those two club – who have between them best represented the Basque country in Quatorze rugby for the past two decades – were both in real relegation trouble. For sure Lyon will occupy bottom place but their companions for relegation to Pro D2 looked odds on to be Basque. Biarritz, led by their larger than life chairman, Serge Blanco, were well primed for the visit of Clermont and believed that a victory over the highest-flying French team of all would be the catalyst for Top 14 safety and possibly even European glory in the Amlin Cup. And so it came to pass, with a lot of passion but a very specific game plan, discharged by the competitive instincts of two genuinely great players in key positions – Harinordoquy and Yachvili. Have Leinster Got Their Own ‘How’ And ‘Why’? 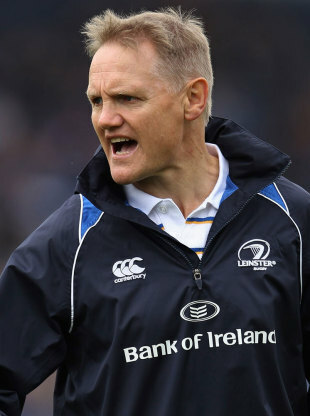 When he took over in August 2010, Joe Schmidt must have surprised some of his players – and maybe even his fellow coaches – by the sheer audacity of his planning. Brian O’Driscoll’s try against Cardiff Blues in the quarter-final, recently awarded Leinster Rugby’s ‘Try of the Season’, may have topped the bill in the catalogue of the fantastic, but it is the sort of rugby that Schmidt has been coaching into Leinster since he took on the job. Schmidt's gameplanning is going to be a big factor when he comes up against his old team. Leinster performances since the season began have provided many moments of brilliance, and a large number of cracking tries. In their home fixtures in the Heineken Cup, they’ve absolutely blown the doors off the four teams they’ve faced by halftime: after forty minutes of rugby in each game, it was 31 – 6 vs Glasgow; 24 – 6 vs Bath; 20 – 0 vs Montpellier [in the pool stages]; and 27-3 vs Cardiff [in the quarter-final]. In the light of such a run of results and such excellent home form, sometimes it can be difficult to recall the mundane. However, notwithstanding performances such as these, part of the ‘why’ Leinster can win through to the ERC Final next Sunday is because they refuse to accept defeat, even if they cannot conjure a performance to match their ambition. Leinster have won more than their fair share of tight, ugly games this season, be it the 16-13 win over the Scarlets in the RDS in February, a win guaranteed with Fergus McFadden’s last-kick-of-the-game penalty; the ugly 13-18 away win in Bath in November in the Heineken Cup; or the three consecutive tight away wins in January [13-15 vs Connacht, 19-23 vs Cardiff Blues in the Pro 12 and the aforementioned 16-23 win over Glasgow in Firhill] that preceded a facile 25-3 win over Montpellier in the RDS that sealed their position at the top of the pool. No longer is it necessary for Leinster to win in style. 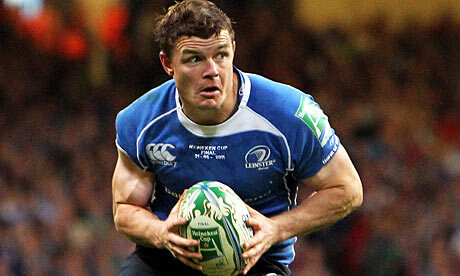 Brian O'Driscoll: big game players don't come much better than this guy. Away semi-finals in the Heineken Cup are big games by anybody's standards, and as well as O'Malley and McFadden have played in his absence, Leinster's chances go up when O'Driscoll plays. Leo Cullen and Shane Jennings may have brought the seeds of that ‘win at all costs’ attitude back from Leicester a few years ago, but it has flourished in Leinster soil. Brian O’Driscoll always had an insatiable appetite for the tough stuff, and Jonno Sexton has had to fight some very public battles to get to where he is today. Sean O’Brien brings a contrarian toughness to everything he does, be it scrabbling at the breakdown in contorted body positions or knocking over would-be tacklers. Isaac Boss brought his own brand of positivity when he arrived down from Ulster: he’s the happy warrior, always geeing up his team-mates and getting in the thick of things. The legendary Brad Thorn brings the experience of nineteen seasons of first class competitive rugby in two codes to the engine room; as much as anybody in the professional era, he embodies Lions coach Ian McGeechan’s phrase of the ‘test match animal’. That grit in adversity show ‘why’ Leinster can win this tough fixture on foreign soil. Pinpointing ‘how’ they’ll do it is more problematic. Has the Leinster team got more pace than Clermont have power? Maybe – but will conditions and refereeing allow them to assert that advantage? Here in Mole Towers, we have often mused over the history of defeats of Irish teams, club or country, when the expectation was highest. One of our truisms has been that “When opponents pay Irish teams the respect of trying to stop us playing, it usually works”. Well this time the shoe may well be on the other foot. Joe Schmidt [and Jono Gibbes, Greg Feek and Richie Murphy] may well have decided to go to Bordeaux intent on ensuring that his once-beloved Clermont do not get the big engines fired up and the wagons rolling. This isn’t a home fixture, when you can rely on the crowd noise to get the ref giving tight calls your way and the visiting team to be somewhat cowed by unfamiliar circumstances, a different stadium and a hostile crowd. In a head-to-head battle on a sodden Stade Chaban-Delmas surface, with a disgruntled English referee who has a [perhaps undeserved] reputation for home-town results, Joe Schmidt may just decide to reduce the margins of risk and play this game through the boots of Sexton and Boss, allied to the guile of Thorn, Cullen, O’Driscoll, Heaslip, D’Arcy and Strauss. No spectacle, lots of grind. Maybe it’ll be labelled more Ulster than Leinster. But it could well be efficient, semi-final fare. Would the Mole be disappointed? No. Would the Mole be surprised? No. Victory at this point in the season is too important for either team to present their opponents with any needless opportunity. And that may well be the way that Joe Schmidt sees it too. This entry was posted in Heineken Cup, Match Preview and tagged ASM, Brad Thorn, Brian O'Driscoll, Clermont Auvergne, Heineken Cup, Isaac Boss, Joe Schmidt, Leinster, The Milky Bar Kid, Vern Cotter, Vincent Debaty by dementedmole. Bookmark the permalink. Been looking forward to this article all week and as always you guys deliver. Mere coincidence you show a pic of Radge with that caption? Thought as much! To be honest, didn’t even notice that was ROG until you brought it up! 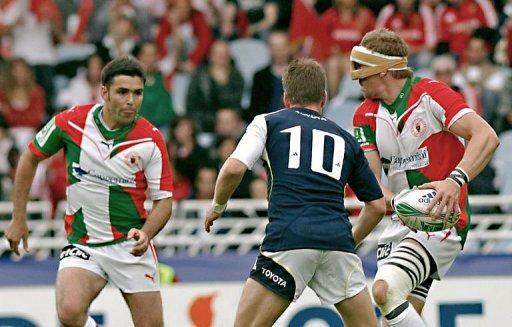 Obviously recognized from Harinordoquy’s face bandage that it was the 09-10 semi-final [and who else would be playing No10 for Munster except O’Gara?] but the two thoughts never introduced themselves to each other. Oh any thoughts on Luke and his contract negotiations and Shaggy’s recent comments? Discussion over on reddit where meatpaste has provided this link and (legitimately I think) questioning Shaggy’s angle. We all give Frankie “Jobs for the Boys” Sheahan plenty of stick for his antics as pundit and manager, are we missing something? Or is meatpaste reading too much into it.